See the map below of the local area. Directions to the Kirkwood house If you are traveling from outside the Northeastern Oklahoma area, obtain a map and locate the cities of Tahlequah and Stilwell, Oklahoma. If you are flying into the area you will probably want to fly into Tulsa (directions) (airport info). The two other major airports are located at Fayetteville and Fort Smith, Arkansas. Our home is approximately 80 miles from Tulsa, and 60-miles from Fayetteville and Ft Smith, Arkansas. 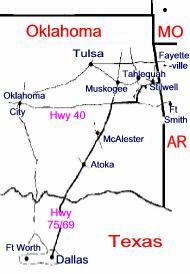 From the intersection of Hwys 62 (Muskogee Blvd) and 82, go south on 82 for ten miles. At this point (just after you cross over the bridge, turn left on Hwy 100 heading toward Stilwell. From this intersection of Hwy 82 on 100 you will drive 6 miles. You will see the green sign denoting Adair County. Just past this you will see another sign marked, "Cherokee Children Mission." Turn right onto the dirt road. You will be travelings 2 miles down this road to our house. At one-tenth of a mile you will turn left at the "T". Then at 1.7-miles you will take a right at the "Y". Shortly thereafter you will see the back of the B&A building. This is a tan colored metal building. Next on the right you will see our red ranch style house. Drive a little past the house to pull into the parking area. From the intersection of Hwy 59 (Oklahoma) and Hwy 100, go west on Hwy 100 for eleven miles. You will see the "Cherokee Children Mission" sign on your right. Turn left onto the dirt road. You will be going a total of two miles from this point. At one-tenth of a mile turn left at the "T". Then at 1.7-miles take a right at the "Y" and you will soon see the back of the B&A building. Drive past the house to pull into the parking area. Pick up a local Tulsa/Airport map at the airport car rental area. On that map locate the Broken Arrow Freeway, which becomes the Muskogee Turnpike (you will need $1.25 for the toll booth). Take this for approximately 20 miles (going generally southest). Exit Hwy 62 (the second Hwy 62 exit) going east to Tahlequah. 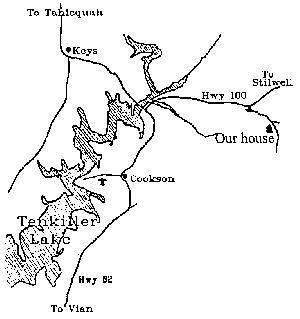 Drive approximately 18 miles to Hwy 100, just before you would start into Tahlequah. Turn right on Hwy 100 going south. See the balance of the instructions above under "From Tahlequah." From Dallas: from LBJ/635 (reference point) take Highway 75 (Central Expressway) north across the Red River into Oklahoma and drive 196.6 miles to the Oklahoma Highway 40 (just before you reach the city of Checotah). Take Hwy 40 East for 32.2 miles to Exit #297 (Hwy 82 North Vian/Tahlequah - Tenkiller Lake). Turn left and take Hwy 82 North (Hwy 100 will join 82 south of the lake) for 22.7 miles to the intersection of Hwy 82 and Hwy 100 (just before you would go across the north end of the lake). Turn right and drive 6 miles. You will see the green sign denoting Adair County. Just past this you will see another sign marked, "Cherokee Children Mission." Turn right onto the dirt road. You will be traveling 2 miles down this road to our house. At one-tenth of a mile you will turn left at the "T". Then at 1.7-miles you will take a right at the "Y". Shortly thereafter you will see the back of the B&A building. This is a tan colored metal building. Next on the right you will see our red ranch style house. Drive a little past the house to pull into the parking area. Cherokee Landing State Park is located on the eastern side of Lake Tenkiller. The entrance to the park is on Hwy 82, just one mile north of the intersections of Hwy 82 and Hwy 100 (going to Stilwell). See the large "local" map above for more details.